United Arab Emirates holds its first-ever elections. The first elections ever to be held in the United Arab Emirates took place on 16 December, 18 December and 20 December 2006. Half of the Federal National Council, which has forty members, were elected. Abu Dhabi and Fujairah voted on 16 December; Dubai and Ras al-Khaimah on 18 December; Sharjah, Ajm?n and Umm al-Quwain on 20 December. Only 6,689 of the more than 300,000 citizens over 18 years were allowed to vote, 1,163 of them women; all of these voters were chosen by the rulers of the seven emirates. One of the four seats in Abu Dhabi went to a woman, Amal Abdullah al-Kubaissi. Among the twenty members chosen by the Electoral College, one woman was elected. Eight women were appointed by the rulers of the seven emirates and, with the exception of Umm al-Qaiwain, at least one woman was appointed by each emirate. Women therefore constituted 22.5% of the Council’s membership, a significant increase. Three among those appointed were from Dubai. The TV channel, Al Jazeera English launches worldwide. Al Jazeera English is a Qatari pay television news channel owned and operated by Al Jazeera Media Network, headquartered in Doha, Qatar. It is the first English-language news channel to be headquartered in the Middle East. Instead of being run centrally, news management rotates between broadcasting centers in Doha and London. The channel was launched on 15 November 2006 at 12:00 GMT. It had aimed to begin broadcasting in June 2006 but had to postpone its launch because its HDTV technology was not ready. The channel was due to be called Al Jazeera International, but the name was changed nine months before the launch because “one of the Qatar-based channel’s backers decided that the broadcaster already had an international scope with its original Arabic outlet”. The channel had expected to reach around 40 million households, but it far exceeded that launch target, reaching 80 million homes. As of 2009, Al Jazeera’s English-language service can be viewed in every major European market and is available to 130 million homes in over 100 countries via cable and satellite, according to Molly Conroy, a spokeswoman for the network in Washington. Al Jazeera English and Iran’s state-run Press TV were the only international English-language television broadcasters with journalists reporting from inside both Gaza and Israel during the 2008–2009 Israel-Gaza conflict. Foreign press access to Gaza has been limited via either Egypt or Israel. However, Al Jazeera’s reporters Ayman Mohyeldin and Sherine Tadros were already inside Gaza when the conflict began and the network’s coverage was often compared to CNN’s initial coverage from inside Baghdad in the early days of the 1991 Gulf War. The Alaskan volcano, Mount Cleveland erupts. Eruptions from Mount Cleveland are generally vulcanian and strombolian in nature, characterized by short explosive ash clouds sometimes accompanied by a’a flows, lava fountains, pyroclastic flows, ash and steam emissions, lava dome growth, and the ejection of breadcrust bombs. Hot springs were reportedly found on the volcano in the 1800s, and persistent fumarolic activity was observed in the 1980s and 1990s. Mount Cleveland is a site of persistent steam emissions and thermal anomalies that represent constant background activity. During 2011, a summit lava dome formed, by continuous intrusion of magma at the summit. Late in 2011, nearly 6 explosions demolished the dome. In June 2012, another small dome was observed. Little is known about Cleveland’s early eruptive history as its remoteness makes it a difficult area to investigate, and discrepancies in names have caused confusion between events there and those on nearby Carlisle. Even today, not all possible events are confirmed as eruptions by the Alaska Volcano Observatory, and many are listed as “possible.” In observed history, Mount Cleveland may have first erupted in 1744; the first confirmed eruption occurred in 1828. The volcano erupted again in 1836, 1893, 1897, 1929, 1932, and 1938. The first notable eruption from Mount Cleveland was a Volcanic Explosivity Index 3 Vulcanian eruption that occurred between June 10 and June 13, 1944. Lava flows extended 5 km from the summit, and an ash plume 6,000 m high was produced. Large boulders were reportedly ejected and carried out to sea by eruptive force. The eruption had the distinction of being the only confirmed direct volcanic fatality in Alaska; a small detachment from the Eleventh Air Force was stationed on the volcano at the time, and one Sergeant Purchase left his post early in the eruption to take a walk and never returned, probably killed by mudslides. At approximately 10:20, a boat sent to search for Purchase witnessed the end of the eruption. The island was abandoned for the remainder of the war. Mount Cleveland erupted more recently in 1951, 1953, 1954, 1975, 1984 through 1987, 1989, 1994, and 1997. The volcano has received more focused attention in recent times due to its increased activity: it erupted in 2001, 2005, three times in 2006, 2007, three times in 2009, and twice in 2010. Of these, the most significant eruption was the 2001 eruption, which produced a 12 km high ash plume. This plume dispersed 120 to 150 km 75 to 93 mi across Alaska, an unusual distance that allowed detailed satellite observations to be made. Nikolski and the surrounding region was the site of several hours of ashfall, represented in satellite imagery as areas of discolored snow.This eruption significantly disrupted air traffic in the area. On June 19, 2012, a pilot reported an ash-producing explosion on Mount Cleveland. Due to continuing seismic activity, the volcano was placed on the USGS Volcano Watch List in the orange or “watch” category the following day. AVO continues to keep Cleveland on the watch because of a persistent anomaly at the summit. AVO suspects it could be dome growth. Other minor ash producing explosions occurred on June 26, July 12, and August 19. Michelle Bachelet is inaugurated as first female president of Chile. On January 15, 2006, Michelle Bachelet became Chile’s first woman president-elect. Bachelet came in first in the December 2005 election but did not manage to win a majority in that race, so she faced a runoff in January against her nearest opponent, billionaire businessman, Sebastian Pinera. Earlier, she was minister of defense in Chile, the first woman in Chile or all of Latin America to serve as a minister of defense. Bachelet, a Socialist, is generally considered a center-leftist. While three other women have won presidential elections in the Americas, Bachelet was the first to win a seat without first becoming known through a husband’s prominence. Her term in office ended in 2010 because of term limits; she was reelected in 2013 and began serving another term as president in 2014. Michelle Bachelet was born in Santiago, Chile, on September 29, 1951. Her father’s background is French; her paternal great-grandfather emigrated to Chile in 1860. Her mother had Greek and Spanish ancestry. Her father, Alberto Bachelet, was an air force brigadier general who died after being tortured for his opposition to Augusto Pinoche’s regime and support of Salvador Allende. Her mother, an archaeologist, was imprisoned in a torture center with Michelle in 1975, and went into exile with her. In her early years, before her father’s death, the family moved frequently, and even lived in the United States briefly when her father worked for the Chilean Embassy. Michelle Bachelet studied medicine from 1970 to 1973 at the University of Chile in Santiago, but her education was interrupted by the military coup of 1973, when Salvador Allende’s regime was overthrown. Her father died in custody in March of 1974 after being tortured. The family’s funds were cut off. Michelle Bachelet had worked secretly for the Socialist Youth, and was imprisoned by the Pinochet regime in 1975 and held in the torture center at Villa Grimaldi, along with her mother. From 1975-1979 Michelle Bachelet was in exile with her mother in Australia, where her brother had already moved, and East Germany, where she continued her education as a pediatrician. Bachelet married Jorge Dávalos while still in Germany, and they had a son, Sebastián. He, too, was a Chilean who had fled the Pinochet regime. In 1979, the family returned to Chile. Michelle Bachelet completed her medical degree at the University of Chile, graduating in 1982. She had a daughter, Francisca, in 1984, then separated from her husband about 1986. Chilean law made divorce difficult, so Bachelet was unable to marry the physician with whom she had her second daughter in 1990. Bachelet later studied military strategy at Chile’s National Academy of Strategy and Policy and at the Inter-American Defense College in the United States. Michelle Bachelet became Chile’s Minister of Health in 2000, serving under socialist President Ricarco Lagos. She then served as Minister of Defense under Lagos, the first woman in Chile or Latin America to hold such a post. Bachelet and Lagos are part of a four-party coalition, Concertacion de Partidos por la Democracia, in power since Chile restored democracy in 1990. Concertacion has focused on both economic growth and spreading the benefits of that growth throughout segments of society. After her first term as president, 2006 – 2010, Bachelet took a position as the Executive Director of UN Women. A methane explosion in a coal mine near Nueva Rosita in Mexico kills 65 miners. Palau, Mexico — Fermin was a mechanic, not a coal miner, but on the morning of February 19, 2006 he had to go down into the Pasta de Conchos mine near here to fix a broken cart that couldn’t haul the coal out. Five years later, Fermin’s remains are still more than 100 meters (109 yards) below the ground, together with dozens of miners who worked that night. So that he won’t forget, his mother, Maria de Lourdes, sets aside part of her widow’s pension — 2,200 pesos a month — to buy any newspaper that publishes something about the incident. She cuts articles and photos, and pastes them in an album. That Sunday, just past 2:30 a.m., an explosion left 65 miners buried who were working inside the Pasta de Conchos mine, in the Mexican state of Coahuila, in northern Mexico. The mine is owned by Grupo Mexico, one of the largest mining companies in the country. Then-President Vicente Fox never visited the relatives mourning at the mine site. President Felipe Calderon has also avoided meeting with the more than 300 family members. After five years, the relatives and about five widows continue asking for the bodies to be retrieved from the mine. Citing dangerous conditions, the company abandoned the attempts to pull them out. Maria de Lourdes says that a year and a half ago, she stopped receiving the 420 pesos the-ex governor of Coahuila sent so that the children of the miners could continue studying. She sells baby clothing to complement her income and keep her son in school. She doesn’t want Daniel Ezequiel to be a coal miner. There are several versions about the cause of the incident that killed the workers. Grupo Mexico says that there was an explosion caused by a ball of gas — gas that escapes from the earth at the moment of the coal extraction — and that as a consequence, the temperature in the mine rose to more than 900 degrees Celsius. However, according to the autopsies of the only two bodies that were pulled from the mine, their deaths were caused by asphyxiation, not burns. Those two bodies were located in the ninth diagonal tunnel in the mine. Grupo Mexico says it went nearly 2.8 kilometers into the mine, but hadn’t found the other remains. In February 2007, the Coahuila state government produced 65 death certificates certified by a medical examiner, even though only two bodies had been recovered. With 63 bodies still underground, Grupo Mexico decided to suspend the rescue of the bodies in April 2007. At that time, the company argued that according to their investigations, 25% to 75% of the mine was flooded and “the water possibly is contaminated by HIV, tuberculosis, hepatitis, that could contaminate the rescuers, their families and entire populations.” These findings were given to the Pasta de Conchos Family Organization, which has advised the victims’ relatives. Inspection records from a few months before the blast revealed that the ventilation system was failing and that there were problems with the electrical equipment. Some family members say the workers complained of a strong odor of gas. Through a spokesman, Grupo Mexico declined to speak about the incident, citing internal policies. Cristina Auerbach, lawyer for the victims’ relatives in the Pasta de Conchos Family Organization, said that explosions in the regions’ mines had been recorded since 1889. Even then, the only times that bodies were left inside the mine were 1889 and 2006. In the rest of the cases, the bodies were always recovered, alive or dead. Auerbach recalled one of the biggest blasts that happened in 1969 in the town of Barroteran. In the Guadalupe mines, more than 160 people died. A little over a year later, all the bodies were recovered. In northeast Coahuila, it’s common to find someone who has a miner in the family. Walking down the streets of towns like Nueva Rosita, Palau, San Juan Sabinas and Muzquiz, you can see trucks full of freshly mined coal at all hours. At the end of each shift — around 3 p.m., 10 p.m. and 6 a.m. — trucks pass by with men whose faces are painted black by the carbon dust that fell on them during their 12 hours of work. Nearly all the coal in Mexico is produced in Coahuila, according to the National Institute of Statistics, Geography and Information. Raul Villasana, retired at age 67, also was a miner. He worked for more than 20 years in Grupo Mexico’s mines. One of his sons remains inside Pasta de Conchos. He and his wife Trinidad have traveled several times to Mexico City to participate in demonstrations in front of Grupo Mexico and the Labor Ministry to plead for the excavation of their son. Villasana’s son left behind a son and two daughters. The widow decided to invest the 750,000 pesos that the family received from the company to set up a used clothes business that she supplies from the United States. Maria de Lourdes, Fermin’s widow, knows the mining life well. Her father, Arsenio, was also a miner. He mined black gold from Pasta de Conchos. He retired several years before the blast. Arsenio thinks those were the sounds of the last surviving miners. “Though after all that time there is no way that they could come out alive,” he stated. For residents like Villasana and Arsenio, Pasta de Conchos turned from a mine into a cemetery the morning of February 19. 2006. The 2006 Madrid–Barajas Airport bombing occurred on 30 December 2006 when a van bomb exploded in the Terminal 4 parking area at the Madrid–Barajas Airport in Spain, killing two and injuring 52. On 9 January 2007, the Basque nationalist and separatist organisation ETA claimed responsibility for the attack. The attack, one of the most powerful carried out by ETA, damaged the airport terminal and destroyed the entire parking structure. The bombing ended a nine-month ceasefire declared by the armed organisation and prompted the government to halt plans for negotiations with the organisation. Despite the attack, ETA claimed that the ceasefire was still in place and regretted the death of civilians. The organisation eventually announced the end of the ceasefire in June 2007. Ordered and planned by then head of commandos Miguel Garikoitz Aspiazu Rubina alias Txeroki, the attack was carried out by the “commando Elurra”, whose members were arrested in early 2008 and sentenced for the attack in May 2010. Txeroki was arrested in November 2008 and is awaiting trial for the bombing. The Lebanon Israel war begins. The 2006 Lebanon War, also called the 2006 Israel–Hezbollah War and known in Lebanon as the July War and in Israel as the Second Lebanon War was a 34-day military conflict in Lebanon, Northern Israel and the Golan Heights. The principal parties were Hezbollah paramilitary forces and the Israel Defense Forces. 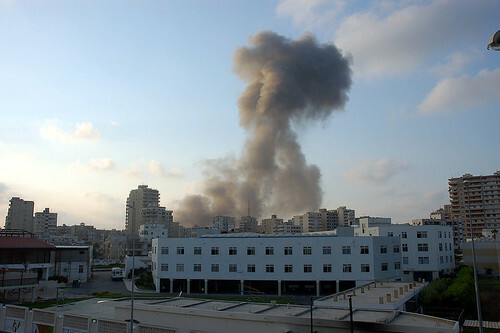 The conflict started on 12 July 2006, and continued until a United Nations-brokered ceasefire went into effect in the morning on 14 August 2006, though it formally ended on 8 September 2006 when Israel lifted its naval blockade of Lebanon. Due to unprecedented Iranian military support to Hezbollah before and during the war, some consider it the first round of the Iran–Israel proxy conflict, rather than a continuation of the Arab–Israeli conflict. The conflict was precipitated by the 2006 Hezbollah cross-border raid. On 12 July 2006, Hezbollah fighters fired rockets at Israeli border towns as a diversion for an anti-tank missile attack on two armored Humvees patrolling the Israeli side of the border fence. The ambush left three soldiers dead. Two Israeli soldiers were abducted and taken by Hezbollah to Lebanon. Five more were killed in Lebanon, in a failed rescue attempt. Hezbollah demanded the release of Lebanese prisoners held by Israel in exchange for the release of the abducted soldiers. Israel refused and responded with airstrikes and artillery fire on targets in Lebanon. Israel attacked both Hezbollah military targets and Lebanese civilian infrastructure, including Beirut’s Rafic Hariri International Airport.The IDF launched a ground invasion of Southern Lebanon. Israel also imposed an air and naval blockade. Hezbollah then launched more rockets into northern Israel and engaged the IDF in guerrilla warfare from hardened positions. Over 400 die when the Indonesian passenger ferry MV Senopati Nusantara sinks. The M/s Senopati Nusantara was an Indonesian ferry that sank in a storm on December 30, 2006. The Japanese-made ship was a scheduled passenger liner from the port of Kumai in Borneo to Tanjung Emas port in Semarang, East Java. About 40 km off Mandalika island, the ship sank during a violent storm in the Java Sea. At least 400–500 people are thought to have drowned. Initial reports claimed as many as 800 were on board, although this was later lowered to around 628, including 57 crew. Design capacity was 1,300 passengers.On December 30, 2006, the ship sunk about 40 km off Mandalika island. According to the manifest, the ship was carrying 628 people including 57 crew, but later press releases from government officials gave an inconsistent number of total passengers. Initially, stormy weather was suggested to be the main cause of the disaster. Local officials of the Meteorology and Geophysics Agency, however, did not ban the vessel from sailing, and the official at the Kumai port issued a sailing permit based on the weather report.According to one survivor’s account, the ship rolled over and part of the hull was sticking out the water before it submerged into the sea. The United Arab Emirates holds its first-ever elections. Abu Dhabi and Fujairah voted on 16 December; Dubai and Ras al-Khaimah on 18 December; Sharjah, Ajm?n and Umm al-Quwain on 20 December. Only 6,689 of the more than 300,000 citizens over 18 years were allowed to vote, 1,163 of them women; all of these voters were chosen by the rulers of the seven emirates. One of the four seats in Abu Dhabi went to a woman, Amal Abdullah al-Kubaissi. The government has expressed that future elections will be more participatory, including that the powers of the Federal National Council will be expanded and that the right to vote will be granted to all citizens. A motion tabled by Prime Minister Stephen Harper that recognizes the Québécois as a nation within Canada is passed. The House of Commons has overwhelmingly passed a motion recognizing Québécois as a nation within Canada. Conservatives, most Liberal MPs, the NDP and the Bloc voted 266 to 16 in support of the controversial motion, which earlier in the day had prompted the resignation of Michael Chong as intergovernmental affairs minister. Stephen Harper votes for a motion recognizing Québécois as a nation in Canada. Fifteen Liberal MPs voted against the motion, including Liberal leadership candidates Ken Dryden and Joe Volpe, along with Independent MP Garth Turner. The prime minister has said he is using the word nation in a “cultural-sociological” rather than in a legal sense. But on Monday afternoon, Chong said he opposed the motion and would abstain from voting because it “implies the recognition of ethnicity.” “I believe in this great country of ours and I believe in one nation, undivided, called Canada, based on civic and not ethnic nationalism,” he said.